For years, Maria Jaramillo worked as an international tax consultant but at the end of the day she knew in her heart of hearts, her clients weren’t always completely happy with the results. “As a tax consultant, I was cleaning up clients’ pasts,” she said. And so at a networking gathering early this year when talk turned to the joys of skin care specialists, Jaramillo perked up. She knew how good it felt to be on the receiving end of an esthetician. Maybe she was missing something. She researched the idea and in August, the 33-year-old Smyrna woman enrolled in The Elaine Sterling Institute in Sandy Springs, joining a growing number of people, women in particularly, seeking second and third careers as estheticians. 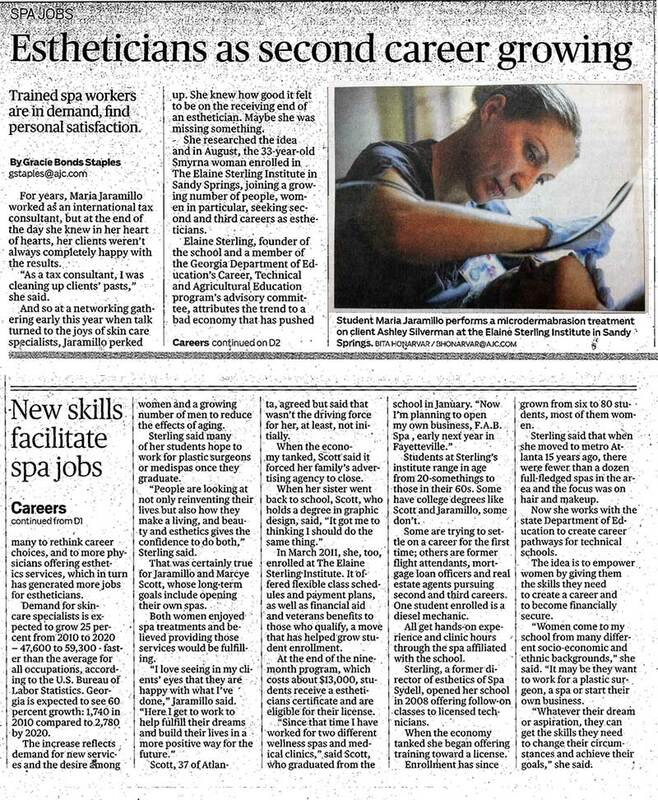 Elaine Sterling, founder of the school and a member of the Georgia Department of Education’s Career, Technical and Agricultural Education program’s advisory committee, attributes the trend to a bad economy that has pushed many to rethink career choices, and to more physicians offering esthetics services, which in turn has generated more jobs for estheticians. Demand for skincare specialists is expected to grow 25 percent from 2010 to 2020 — 47,600 to 59,300 – faster than the average for all occupations, according to the U.S. Bureau of Labor Statistics. Georgia is expected to see 60 percent growth: 1,740 in 2010 compared to 2,780 by 2020. The increase reflects both demand for new services and the desire among women and a growing number of men to reduce the effects of aging. Sterling said many of her students hope to work for plastic surgeons or medispas once they graduate. “People are looking at not only reinventing their lives but also how they make a living, and beauty and esthetics gives the confidence to do both,” Sterling said. That was certainly true for Jaramillo and Marcye Scott, whose long-term goals include opening their own spas. Both women enjoyed spa treatments and believed providing those services would be fulfilling. Scott, 37 of Atlanta, agreed but said that wasn’t the driving force for her, at least, not initially. When the economy tanked, Scott said it forced her family’s advertising agency to close. In March 2011, she, too, enrolled at The Elaine Sterling Institute. It offered flexible class schedules and payment plans, as well as financial aid and veterans benefits to those who qualify, a move that has helped grow student enrollment. At the end of the nine-month program, which costs some $13,000, students receive a estheticians certificate and are eligible then to sit for their license. Students at Sterling’s institute range in age from 20-somethings to those in their 60s. Some have college degrees like Scott and Jaramillo, some don’t. Some are trying to settle on a career for the first time; others are former flight attendants, mortgage loan officers and real estate agents pursuing second and third careers. One student enrolled is a diesel mechanic. All get hands-on experience and clinic hours through the spa affiliated with the school. Sterling, a former director of esthetics of Spa Sydell, opened her school in 2008 offering follow-on classes to licensed technicians. When the economy tanked she began offering training toward a license. Enrollment has since grown from six to 80 students, most of them women. Sterling said that when she moved to metro Atlanta 15 years ago, there were fewer than a dozen full-fledged spas in the area and the focus was on hair and makeup. The idea is to empower women by giving them the skills they need to create a career and to become financially secure.